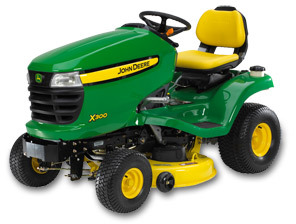 I purchased a new X300 John Deere last week. At this time of the year, I have to cut my Zoysia grass very low for the new seasons growth. I have been doing this each year with a Honda bagger mower, but with some health problems, this was getting too much for me. I bought the X300 with a bagger not knowing what to expect. Much to my surprise, I could not be more satisfied with the machine. I considered a Craftsman 24 h.p. profession tractor but after looking at the X300, I could see several advantages with the X300. I have run my tractor for over 2 1/2 hours now and the bagger works very well. The tractor has very good power and great turning radious. At this point in time, I just could not be more pleased with this product.